Liquid Web is one of the best managed WordPress and cloud hosting provider. They are famous for their fast and high quality support, known as ‘Heroic Support’. Their managed WordPress hosting option includes staging sites, automatic updates, image compression tools, free SSL, powerful developer tools, and an intuitive dashboard to manage all your WordPress sites in one place. They are offering WPBeginner users an exclusive 69% off discount on the first 3 months! Use our Liquid Web coupon below to get 69% off your managed WordPress hosting account. How to Use Liquid Web Coupon Code? 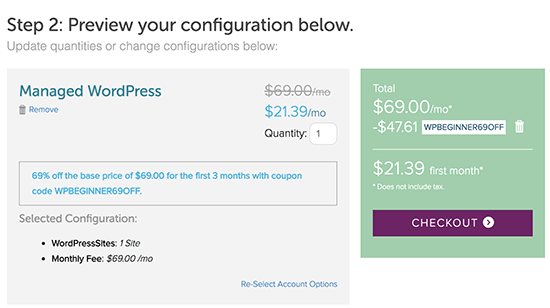 WPBeginner’s exclusive Liquid Web coupon code helps you get 69% off your first three months of their managed WordPress hosting. All you have to do is follow the instructions below to properly redeem the Liquid Web coupon code, so you can get maximum discount on Liquid Web. First, your need to visit the Liquid Web website and click on ‘Sign up to Get Started’ button. This will take you to your shopping cart page where you need to click on ‘have a coupon?’ link. This will reveal the coupon code field. You need to enter WPBEGINNER69OFF as your coupon code and click on the ‘Apply’ button. Note: You MUST enter the code and click Apply. The Liquid Web coupon code does not automatically apply itself just because you clicked on our link. The cart page will apply the coupon code, and you will see your new discounted price. You can now click on the Checkout button to complete your purchase. That’s all, you have successfully signed up for Liquid Web managed WordPress hosting using our exclusive discount offer. We hope you found our Liquid Web coupon code to be helpful. At WPBeginner, we work hard to negotiate exclusive discounts for our users.